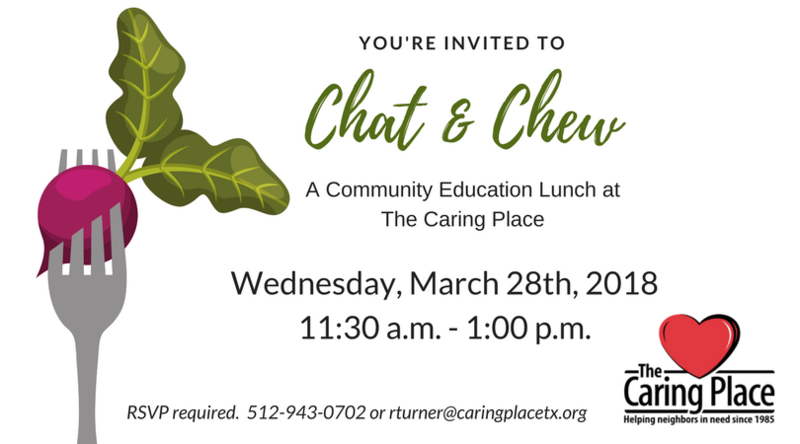 Georgetown, TX, March 12, 2018 The Caring Place first hosted “Chat & Chew” in January as a new way to show people what they are all about. That event proved to be a successful way to engage the community. Future dates of the lunch event are Wednesday, March 28th and Friday, May 18th from 11:30 a.m. to 1:00 p.m. at The Caring Place located on 2000 Railroad Avenue. “We hope through this event, guests not only get their questions answered, but leave knowing the long lasting legacy being created through this organization. It’s an organization with a heart for helping people in a tangible way. It’s community-created and community-supported, making it an incredible resource in northern Williamson County,” says O’Connor. The next Chat & Chews are on Wednesday, March 28th and Friday, May 18th from 11:30 a.m. to 1:00 p.m. at The Caring Place. RSVP is required through Rita Turner at 512-943-0702 or rturner@caringplacetx.org.